Portugal's interior minister has resigned after dozens of people died in a massive outbreak of forest fires. In her resignation letter, Constança Urbano de Sousa said she was leaving to "preserve her personal dignity". The deadly wildfires killed at least 41 people and hundreds more were injured - the second such tragedy this year. Another four died in northern Spain. Portugal's president has also called on parliament to consider if the current government should continue in office. Marcelo Rebelo de Sousa said the government should have a strong mandate in order to enforce fire fighting and forest management reforms to avoid future tragedies. His presidency is largely ceremonial, but he does have the power to dissolve parliament. The opposition People's Party has already tabled a motion of no confidence over the handling of the emergency. Constança Urbano de Sousa's former ministry is responsible for firefighters and the country's civil protection agency. Both have faced public criticism over their handling of the fires. Ms de Sousa had also faced calls for her resignation following a massive blaze in June killed more than 60 people. In her resignation letter, she said she had privately offered the prime minister her resignation at the time, which he refused. But she now felt there were no "political and personal conditions" for her to continue, she said. In a statement, Prime Minister António Costa said he had accepted Ms de Sousa's resignation, despite having earlier ruled out firing any of his ministers. After the June fire, an expert report was commissioned, the recommendations of which will now be considered at a ministers' meeting on Saturday. At one point on Monday, some 6,000 firefighters were deployed to battle the flames, and a state of emergency was declared over almost half of Portugal's landmass. 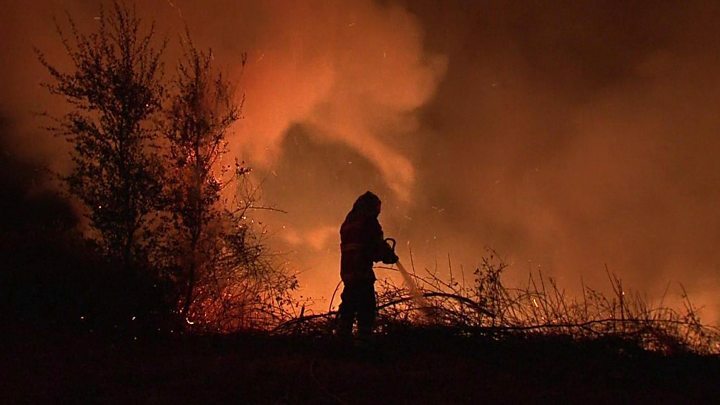 Across the border in Spain, where three people died in the Galicia region, a man has been arrested for starting one of the fires - allegedly through carelessness rather than deliberate arson. Spain's interior minister said he had been detained by the Guardia Civil. The country's politicians are insisting the fires are acts of arson or "terrorism". Prime Minister Mariano Rajoy said one fire had been started at five different points. "It's impossible for this to be triggered under natural circumstances," he said. In Portugal, the hot dry weather and firm winds from Hurricane Ophelia are being credited with spreading the fires so widely, but there has also been speculation about the possibility of arson.